Show your SAARLAND stamps here. The final 1922 stamp returns to an industrial theme, and shows a steelworks. In 1921 stamps originally issued in German currency denominations were overprinted with french currency. This stamp from the set shows the entrance to a mine. 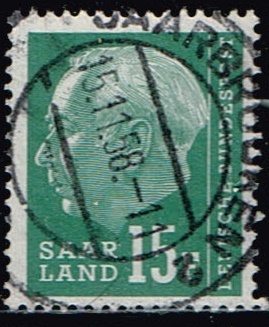 The next overprinted stamp of 1921 shows shipping on the River Saar. Another stamp from the same 1921 set - a view of the River Saar. And here is that slag heap again, which features in the 1922 set. 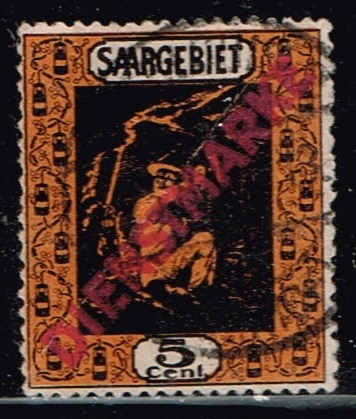 This 1921 stamp shows the signal bridge at Saarbrücken. The colours and printing make it very difficult to see what is portrayed. The church at Mettlach, with a nice cancellation. The old bridge at Saarbrücken - another 1921 stamp. This 1921 stamp shows an industrial cable railway. 1921: the city hall of Saarbrücken. 1921: the President's residence at Saarbrücken.